I was introduced to Tegan & Sara's new album by my friend Craig while I was over in Los Angeles last October, and it was one of the freshest and most interesting albums I'd heard in some time. I don't really know a lot about Tegan & Sara, but I guess that's what Google's for. Apparently they are twins, originally from Calgary, Canada, and "The Con" is their fifth album. The only other track I'd heard by them before was the gorgeous "Walking With The Ghosts" which featured in Grey's Anatomy, and was also covered by The White Stripes. For the record, the original is way better so if you've heard and like the cover I would definitely check out the original too. This album is fantastic, I can't think of any other word to sum it up, and is a must-listen if you like the sound of new single "Back In Your Head". Highlights on the album for me would have to be "Back In Your Head", "Hop A Plane", and title track "The Con". 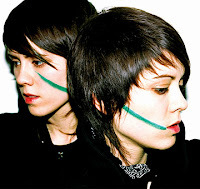 Buy Tegan & Sara music from iTunes.